Formal Outfit Ideas- Formal attire is often asked by the employers to keep the office environment up to the dress code. However, nowadays firms are letting their employees add a few pieces which are often considered semi-formal as in denim pants. Most of the times, all you need to pair a suit or tux aesthetically in order to look formal which is not that complex. However, if you want to detail your ensemble, you will have to add a few accessories like a handkerchief or an enchanting brouche. In order to dress right, first of all, there are a few silhouette rules that are to be followed strictly which includes accurate measurements for the sake of perfect fitting. Your sleeves should neither be shorter nor longer than the bone of your wrist. While picking a shirt make sure that your shoulder and arms are tension free if you really desire to have the perfectly fitted shirt. When it comes to the ideal shoulder length, then it should be such that the shoulder touches exactly the end of the shoulder line. While picking the appropriate length of the shirt, tuck it inside first and lift your arms to check if it is still in its place or not. For the ideal collar size, tuck two fingers inside to make sure that it is neither too tight nor too lose. Following these few rules will make you a pro in shopping formal garments. For the sake of helping those men who love to dress all formal and orthodox, we have gathered so of the dashing formal attire ideas which will make you look like a gentleman as you want to. Here you can check some of the trendy ensembles which will make it easy for you to follow the emerging fashion gurus. Also, you’ll get some chic ideas of accessorizing your formal haute couture this year. When we are talking about slaying cropped pants formally, then the first question that arises in one’s mind is that what should be the ideal length? It should be only half an inch shorter than your ankles. For the sake of looking formal, you can wear cropped cotton pants with a cotton blazer in some dark shade and pastel shirt or simple white shirt. However, cropped pants look the best with the bit or penny loafers as these are moccasin-inspired. Here are 30 Ideal Ways to Style Khaki Pants. Turtleneck sweaters and knitted tops can be turned into a formal staple during winters with a trench coat over it and formal cotton pants. To make it look more professional, oxford shoes are a superb option as these can make nearly semi-formal attires look formal. Summers ask for lighter tones and cooler clothing, even if it is formal. You don’t have vast alternatives when it comes to office apparel. However, a beige cotton blazer with a pastel color light shirt and formal gray or white or even matching beige pants can make you look stunning. However, to make it look high-fashion add a vibrant pocket square to the ensemble. Well, if it has got too boring to wear the same plain suits daily, then for a change try a patterned blazer with either stripes or any elegant pattern which keeps the professional charisma intact. You should always opt for the colors like Alabaster, Artichoke and different frequencies of gray as it is trending like forever. 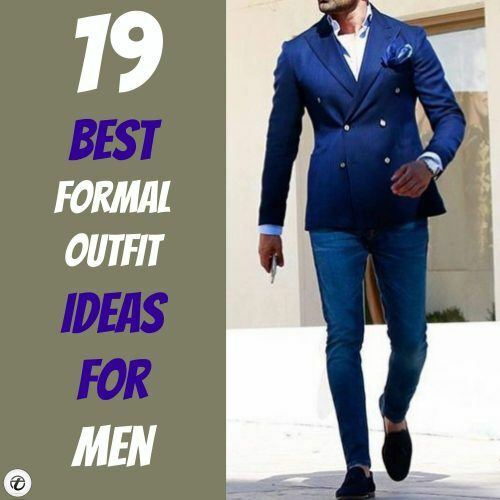 Check out these 18 Latest Men Casual Outfit with Blazer. ↓15- How to Wear White Pants Formally? White pants look good with pastel shirts only, let it be any shade of white or beige or bisque. However, the margin of variation in the styles of blazers is a bit wide as patterned coats and ties always look good with white pants, giving a natural effortless look. Amazon color is one amazing option if you love green as it has a pretty positive associated with it and guys with a strong tan skin can pull this color off with full charisma. This shade looks perfect for weddings and parties with brown dotted ties and white dress shirts and longwing brogue shoes will serve as a perfect shoe option. ↓13- How to Wear Denim Formally? Denim with a slightly dark wash can be worn with a double-breasted blazer and white formal crisp shirt if you want a formal look but cannot miss on jeans. For a dapper yet formal look, go for the classy three-piece with a modern touch i.e. an elegant tie and a handkerchief in the dark shade while the blazer and waistcoat in lighter tones and textured fabric is one amazing option if you are planning to wear a three-piece at some fancy event like a party or some award ceremony. Don’t miss these 20 Ways to Wear a Peacoats for Guys. For an ultimate monochrome look to stand out, always go for a simple floral or catchy brooch or you can also pick a pocket square with a black and gray print on it. Anti-flash white or cream white blazers look perfect with black straight pants if the inner shirt is crisp white with a mandarin collar. Suits are not the only option when you are going to dress formal, you can also go for dark knitted sweaters over white crisp collar shirts and dark color pants. However, you should always opt for simple black or any formal color shoes to keep it professional. Printed gingham or checks are always worn with dress pants formally at offices. Adding a plain tie will spice up the ensemble, making it even more professional. A stripey blazer with a bright collar pocket square is all that you need to slay at work in the most fashionable manner. And here are 20 Ways to Wear Blue Suits with Brown Shoes Ideas for Men. Khaki pants look best with a white mandarin collar or pointed collar shirt, however, folded cuffs and ends of pants can give a unique model-like vibe to your ensemble. 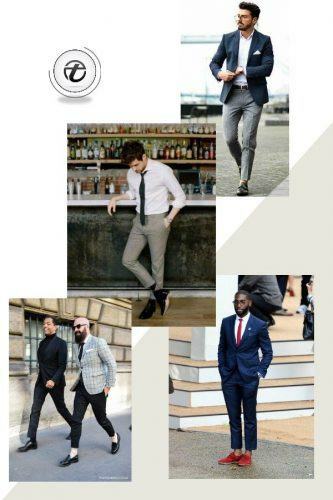 For business tours, men can definitely wear printed pants as in stripes or cheques but the colors should either be black or navy with knitted tops and oxford shoes. A maroon or royal blue suit will look perfect on a reception or even prom night. However, keep the shirt plain and white with matching white shoes to make it look modest. Internees should go for knits during fall and plain shirts with a tie during summers with plain formal skinny pants and perforated oxfords. Do check out these Top 10 Men Formal Shoes Styles And Ideas How to Wear them. An all-white formal safari suit never hurts if you are a designer or work in the art department of a firm. Men’s pastel suits are getting all the hype this spring and are often worn without ties, with pocket squares. Bow ties and tuxedos look good in black and charcoal often, however, if you want to experiment a bit then go for brighter bows or printed ones with a simple dark blazer. Aware us with your favorite formal look in the comments section.